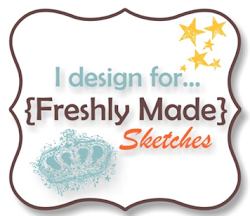 We are celebrating 300 sketches at Freshly Made Sketches this week! How amazing is that? To celebrate this huge milestone, one person will be randomly chosen from the gallery to receive all of our cards! I remember I played along with the very first sketch way back and I definitely my first card (not a fan of that one I can tell you…..). It’s funny (and almost slightly cringeworthy) looking back at my style and the cards I used to make. I ADORE this sketch and as soon as I saw it, I knew I wanted to make a Christmas card in blue and white. You will see that I’ve added a strip of Silver Glitter Ribbon under my sentiment to break up the blue and white and to also add a bit of sparkle. I also LOVE this sentiment from Holly Berry Happiness as it’s the perfect sentiment for when I create cards for the many creative friends I have made overseas. I stamped the sentiment in Basic Black Ink and then punched it out with my Pretty Label Punch. The designer series paper I’ve used is from Bundle of Love Specialty Designer Series Paper and the snowflakes I’ve cut are from Seasonal Layers Thinlit Dies. These dies are so versatile as there are dies for all seasons in them. The girls are Freshly Made Sketches are such a wonderful group of girls that I feel privileged to be a part of. 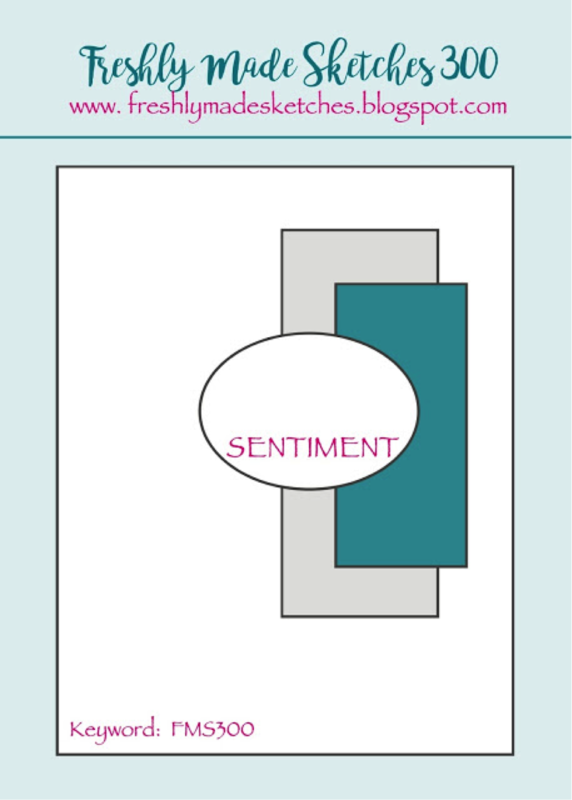 As always, they inspire me and encourage me to create the best cards I can. Head over to Freshly Made Sketches and take a look at the wonderful cards they have created. We would love it if you could play along with our 300th sketch! Stunning! Thanks for sharing this Beauty! Gorgeous! No other way to put it, I love the blue, so soft and reminds one of a cold winter day. I keep forgetting about these gorgeous snowflakes in this set of dies. You’ve used them beautifully here, and I love these colors for a wintry Christmas card. This is gorgeous! I love the soft blue and white for Christmas! Happy 300 Narelle! Cheers to the next 300 ! Wow ! This is fabulous! Love so much this fresh color palette and the gorgeous Snowflakes ! a super great take on this 300th sketch! Wow, what a gorgeous Christmas card! I love the colors, especially that bit of sparkly ribbon! And I am positive that none of your cards are cringeworthy!! Beautiful card Narelle, I love the soft colours and pretty snowflakes. Happy 300th Challenge. Gorgeous, gorgeous card! The snowflakes look so delicate. I just love it! You know your cards are ALWAYS gorgeous. You have a gift for pulling things together to create your “little canvases”. So cool to see the sparkly and subtle and the clear dot – to make this brilliant card. Wow! Really like how you have used the snowflakes?…..
Just beautiful! The colors are cozy and cool at the same time. Super card. This is such a gorgeous card Narelle! I love those little snowflakes and the soft colours! So pretty and perfect for Christmas! This is completely a you sketch, come to think of it! And of course your work is gorgeous. I love everything about this card. So glad you are on this crazy ride with us! !